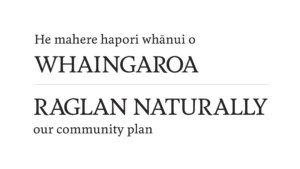 Education in the Whaingaroa-Raglan district reflects the stunning coastal-rural location and with a local community focus on caring for the environment. The many options for early childhood care and education include Kohanga Reo, Raglan Kindergarten, Matapihi Kindergarten, Lets Grow Early Learning Center, Magnolia Tree Childcare, Raglan Playcenter, Playgroup and Homebased care. Raglan Area School caters for primary and secondary students. It is Decile 4, has a Maori Immersion Unit, Te Roopu Aroha ki te Reo, a Surfing Academy and the Enviro Schools Earthcare program. There are 3 rural primary schools in the district at Te Uku, Te Mata and Waitetuna. Some students choose to travel by local bus to Hamilton secondary schools. Adult education opportunities include te reo classes at Poihakena Marae, Whaingaroa Environment Center workshops, Xtreme Waste environmental education and Permaculture workshops at Solscape. The Old School is also well utilised by children and adults for art and hobby classes. Education as a core value of Raglan Naturally – a Learning Community. Not individual thinking, but community support. Please note Kaupapa Maori Education snapshot is being developed. Choice and variety of education providers. Strong community of dedicated and passionate teachers. Our natural environment. Community support. Diverse knowledge in our community. Parents are already concerned about environment and the future so open to making positive changes. Bullying is everywhere, what are we doing about it? What can we do about it? Learning about our shared history – how? Knowing who to ask. Connection from community and support. Trouble finding fluent speakers of te Reo Maori. What resources could be provided that aren’t currently there? Competition between schools – how can we work together for the benefit of all? For schools to be future focused and look at the big picture; what skills will our young people need to survive in an unknown future? Where to begin? Bullying happens everywhere, what can we collectively do about it? Mental health of our young people – how are their needs being met, what support systems are in place? How does this challenge impact on Education? How does Education impact this challenge? What is the opportunity for us in Education in relation to this challenge? ● Encourage bi-lingualism/bi-culturalism for our young people● Provide environmental education● Support the holistic wellbeing of children and whanauProvide early childhood education for all children in the Raglan community. Provide support for families to look after younger children at home. (research shows this is better) Education for parents about young children at home/development. · Education from a variety of sources. · Build connection from community and support. · Grow awareness of things already happening in the community, things that are happening in the home – part of the community kaupapa. Encourage bi-lingualism/bi-culturalism for our young people. To be bilingual and in our education centres and community. · Support our community based programme for fluent speakers to be part of learning in our learning centres. Education as a core value of Rag Nat – a Learning Community that values its tamariki/children, is future focused, environmentally minded, aspires to be bicultural, supports children to be physically active, and values creativity and curiosity in its learners. Empower students to seek knowledge and understanding so that they can be active participants in their community. Schools are future focused and look at the big picture. They provide the skills our young people need to survive in an unknown future. ● What support systems are in place around mental health? ● What can we do about bullying? Support whole system – families, children and their needs. How can student learning be more connected to the community? What alternative learning pathways would you like to see in addition to school based programs? How could our community diversity be better catered for in the learning and teaching process? Is there a role for community mentors supporting students and how could this be implemented? What are your thoughts on personalised/individualised learning programs and use of technology in the teaching/ learning process? What are your thoughts on providing Treaty of Waitangi education programs in our schools and early childhood centres and for adults in our community?